Hang tags are extremely versatile for customizing any gifts, promotional items or products. The die-cut shape is ideal for adding a label to bottles, jars, or any other shape that it can hang from. 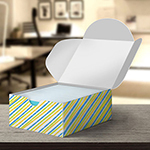 Our full color rectangular box with handle printing can be customized and designed to meet your needs. Promote your company name, products, offer promotional coupons or list recipes and tips with stunning images printed in full-color. Our full color die-cut hang tags are made with the highest quality materials and best full-color printing process. Choose from our three premium card stocks to suit your needs. For a natural look, our 14 pt uncoated card stock is economic at our lowest prices. For ultimate shine, select our durable 16 pt coated card stock coated on both sides. For extra strength and durability, our 18 pt card stock coated on one side is the way to go. We offer full color printing for die-cut hang tags on one or both sides. Die-cut is included to quickly and conveniently label products at high-quantities. We guarantee to deliver top-quality printed materials for any of your packaging and labeling needs. Try our retail shop bag topper card printing and use them to pack and promote your products in bag toppers. The front is printed in the 4 color process, as in 4/4 printing and the back is printed in one color. Black is standard for the one colored side in 4/1 printing. The front and back are printed in the full 4-color process. A well-designed hang tag is an extremely effective, eye-catching promotional tool. These die- cut tags are ideal for offering coupons, nutrition facts, recipes and tips for using your products. 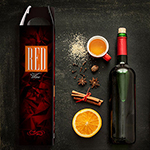 When strategically designed and placed, a hang tag will make your product stand out from all the others on the shelf. With a unique design, hang tags can increase brand or company recognition, and this has a powerful impact on customers and sales trends. Brand recognition makes your company memorable, and providing exceptionally presented promotional items will increase your reputation and business. Die-cut hang tags are popularly used on the necks of bottles and jars to advertise a promotion of a specific product or brand. Offering customers a coupon to compliment a sale will make them want to purchase your products again and again. Consider using a buy one, get one half off or similar promotion and it will definitely increase your business and reputation in the long run. Alternatively, recipes and tips on how to optimize your product will be appreciated by customers so that they can get the most out of their money. 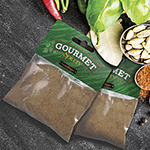 Staying healthy and fit is the latest trend, so keep up by adding nutritional facts or health benefits of your product on your custom hang tags. Full color hang tags add style and appeal and ensure that your brand stands out from the competitors. Our die-cut hang tags are the perfect way to customize gifts or party favors for any event. Present each guest with a bottle of wine or candy adorned with a full color hang tag offering warm wishes or thanking them for their attendance at your event. These durable hang tags printed on premium card stocks can be kept as memorabilia for years to come. The options for using your custom die-cut hang tags to share your message are endless. Our high-resolution, full-color printing will make the graphics and design for your custom hang tags stand out beautifully. 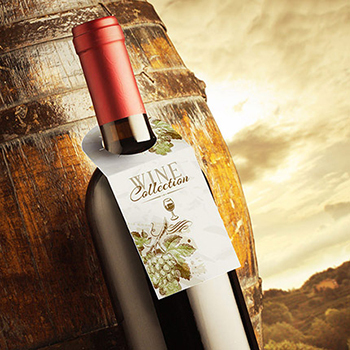 We use these custom tags for labeling wine at our vineyard, and they look amazing! Really a great item. Exceptional product, professional printing and great customer service. Thanks guys! The paper was durable and not cheap, printing was very well done, will order again. 14 pt Uncoated Card Stock 14 pt uncoated card stock is a high-quality offset, durable stock with no coating added to give a natural look and feel with bright colors. 16 pt Card Stock Coated on Both Sides 16 pt card stock is a durable premium card stock. Coating is applied to both sides before printing to provide a smooth surface and excellent ink absorption. 18 pt Card Stock Coated on One Side 18 pt card stock is a heavy premium card stock. The coating is applied to the full-color side before printing to provide a smooth surface and excellent ink absorption. 4/0 - Front Full Color - Blank on Back The front is printed in the 4 color process, as in 4/4 printing but the back (inside) remains blank with no color. 4/1 - Front Full Color - One Color on Back The front is printed in the 4 color process, as in 4/4 printing and the back is printed in one color. Black is standard for the one colored side in 4/1 printing. 4/4 - Full Color on Both Sides The front and back are printed in the full 4-color process.